Patrus joined dZi as the Community Market Facilitator (CMF) for Khotang district in late 2017. 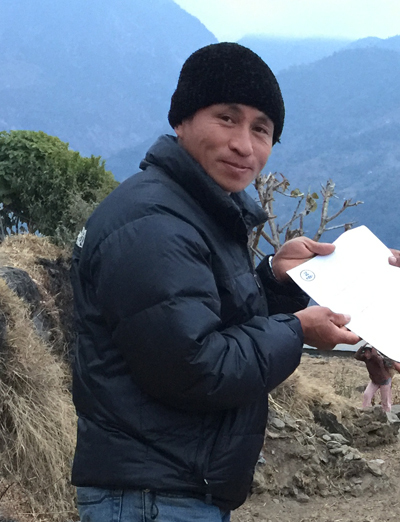 Due to his excellent work at connecting our farmers and their produces with regional and local markets, he has been working as CMF for both Khotang and Solukhumbu district since May 2018. His main responsibilities are keeping track of crops produced by our farmers, connecting our farmers with markets and vendors, keeping tab of price list of major crops in local/regional/national and international markets as well as seeking new markets. Prior to joining dZi, he had also gone abroad in the Middle-East as migrant labor. After returning to Nepal, he was engaged in farming. He was a member of one of our farmer's group in Rakha. Even when working full time for us, his household still maintains a vibrant and productive kitchen garden.